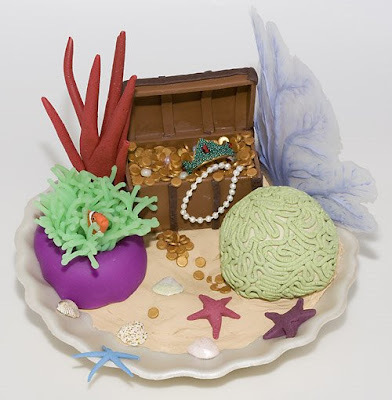 I call it Reef Dreams, but I'm not sure what it is - a sculpture, a miniature, a cute knick-knack? It is about 5 and 1/2 inches across and about 4 inches tall, so it's larger than dollhouse scale. The image just popped into my head and I felt compelled to make it. Now the question is: would anyone buy this? Apparently people buy little scenes with fairies and dragons or mermaids. Scuba divers would like it, I think. 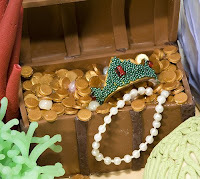 Everything, including the large shell the scene sits on, is made of clay except for the string of "pearls", the jewels on the crown, and a few beads in the chest. 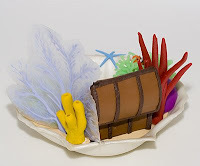 If I make any more, I would probably try to make everything out of clay. What a creative and well executed design Cynthia! I particularly love the little fish peeking out of the ?sea vegetable? As to a market...I'm sure there is one, you justa have to get them to find you. That's a clallenge I have yet to be able to meet. Great Job Cynthia! 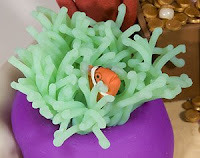 Love LOVE the clownfish in the anemone and the treasure chest...wow, patience! When I was a kid, we had this great big aquarium with all sorts of plants, rocks with nooks and grannies for the fish to hide in. I sure could envision a scene like that in there. I know polymer clay does well in snow globes, so why not aquariums. Am curiuos, which brand of clay did you use?